Alright everyone. I’m starting up Chapter 13! This is uncharted territory for me. I’ve only done 11 pages so far. Stefano is still working on some environments. And I’m finishing up 2 other books for IDW. BUT…I’m SO excited about this chapter (the script is REALLY good…if I say so myself) that I’m going for it. So starting tomorrow…we dive in. I want to thank you all for sticking around these last few weeks while I got things together for the next half of the series. I also want to thank each and every one of you who submitted guest pages, pin-ups, and fan fiction. I know I only got to 12 pages…so I’m going to fill in the rest over the weekends. So everyone can see every guest page. They’re all fantastic. This week is going to be SUPER stressfull…but hopefully everything will come together. I am SO eager to see what you guys think of this chapter. Hope you have a great week and thanks again for your patience. besides i’m happy to see this ugly dwarven-face again, i think you should wait until you have finished at least 2/3 of the new chapter. better 4/5. stress is not good for your physical healthy, and delays not good for any reputation. I’m having the same problem as Limax. Can’t see the guest strips… ?? What’s up with that? Guest strips are gone! I manually enter their URLs and the comments are there, but the images are missing. *is also excited* I can`t wait to see what happens, but don`t over-work yourself Scott. Thanks for your concern. I definitely will make sure and not overdo it. Thank you. As for the guest pages. I added urls to the blog entries. See below the comic for each entry. I figure in months to come. When new readers are reading through. THey may enjoy the making of break. But no need to put them through a dozen guest pages (as wonderful as they are) before they get to chapter 13. So I moved them to the blog below. I hope that’s OK to everyone. Well, the URLs being posted somewhere is fine…but I can’t find said URL’s. Help? Oh, and it’s great to see Chapter 13 starting up! I really enjoyed the guest pages! Some of them were just amazing! I’m also happy that Dreamland is back, but I add my caution to everyone else’s.. don’t burn yourself out Scott!! It’s so great how excited you are to share Ch. 13 with us, but we could wait a little longer! Awesome. Glad you’re back, Scott! Bring on Chapter 13!!! I found the blog entries, but no picturey goodness. 🙁 Oh well… something will happen eventually I know. Just don’t overdo it too much Scott! Argh! I wished you had take another week. I had psyched myself up for no Dreamland story until 1 October so you could get a nice big cushion under you. And some of the guest strips were too funny. BTW, you might put a link to the guest strips on a sidebar somewhere under a “Fanart” button. As Alton Brown would say, “your patience will be rewarded”. Hey! Glad Dreamland is back Scott, (as long as you’re ready). I agree with kamato, perhaps the guest strips would be appropriate in a fanart section. Just a suggestion. Kicking cover for Chap 13! Mr. Indeed himself! i love this comic and would love for you to be able to post a new entry everyday, but we all know that’s not possible. but, I think you have a very loyal fan base and we’re not going to go anywhere. With that said, what if you did new update 3X a week and did the guest strips on the other days? this would allow you a little extra time to build that buffer and not burn yourself out. 🙂 Keep up the awesome work, and know that we all stand behind you! I have to ask, if this guy is so big, how come he’s called a “dwarf”? Kiki dance for the return of the Chronicles. If this is like the rest it will be worth it. Maybe he’s a dwarf giant, the way normal dwarves relate to humans… I dunno, I just like the idea of a dwarf towering over the “lesser races” like that. I love your comic! I bought the Nastajia figurine. I named my WOW fem palladin Nastajia and modeled her after Nastajia! Looking forward to more updates! When are you going to put up the rest of the story?! 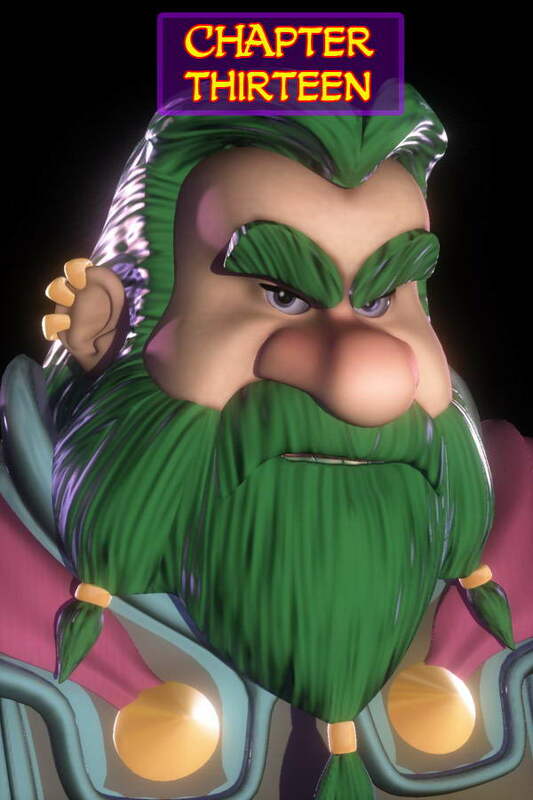 I’ve been wondering: why does he have a green beard? I like that you didn’t bow to the misconcveption that dwarves are always short. In fact, in Norse Mythology, four dwarves hold up the dome of the sky. Not a job for a bunch of runts, eh? Granted, I see no tarnecappes to make them invisable and protect them from the sun (which turnes them to stone) but it is still early in the story. I agree. A link to the guest comics would be very helpful. This goes to a page in the forums where each individual comic is discussed. However, there are only threads for guest comics number 1, 2, 3, 4 and 7. I could not find 5 or 6 or anything above 7, if it exists. And here’s a link to some more of them on Scott’s blog. Glad to see these were kept somewhere. Thanks, Scott. Also, this was my first occasion to read through the old blog posts. If you’re interested in the history of the Dreamland Chronicles, it is a gold mine of information. It’s. About. To go. Down.